SAN FRANCISCO, CA -- (MARKET WIRE) -- September 20, 2006 -- Zero Air Pollution pioneer ZAP (NYSE Arca: ZP) will debut its newest electric cars at this year's San Francisco International Auto Show at the Moscone Center starting Saturday, November 18th. For the first time, the public can sign up to test drive and own ZAP's new XEBRA PK truck or XEBRA Sedan which costs less than $10,000. According to ZAP CEO Steven Schneider, "ZAP's electric vehicles are in even higher demand now that more gas-dependent car companies are closing plants and laying off workers. The public is feeling the pain of rising gas prices and is seeking cost-efficient answers to the energy crisis. ZAP's XEBRAs are the right price at the right time." ZAP calls the new XEBRA Sedan a "City Car." Its unique design is ideal for urban, daily driving. The XEBRA PK Truck is unlike anything available. It can be used as a standard truck, a flat bed, a delivery truck or a dump truck with its easy drop back end. Both vehicles come in different configurations and in a variety of colors. More than 400,000 visitors are expected to attend the Auto Show where ZAP will also have a "Scooter Zone" set up for test driving of the ZAPPY3 electric scooter. The 3-wheeled ZAPPY3 has been critically acclaimed for its maneuverability and stability over similar electric vehicles and ZAP has expanded its line with three new, improved versions. ZAP will also have its off-road electric vehicles on display including the new MUD-E dirt bike and the BUZZZ ATV. The San Francisco International Auto Show runs from November 18-26 at The Moscone Center in downtown San Francisco. ZAP will make vehicles available for news stories in advance on a first-come, first-served basis. Ticket prices for the show are $8.00. Kids under 12 are free. ZAP stands for Zero Air Pollution. Its mission is to be the leading distribution portal of socially responsible and environmentally sustainable, advanced technology vehicles. ZAP is a pioneer at the forefront of electric and other fuel efficient transportation and believes that helping our stakeholders act responsibly, both with regards to our environment and the oil crisis, can go hand-in-hand with generating appropriate returns on our investments. For more information, visit http://www.zapworld.com. Zero Air Pollution pioneer ZAP [NYSE Arca: ZP] will debut its new<br>electric car, the XEBRA, November 18 at the San Francisco<br>International Auto Show. 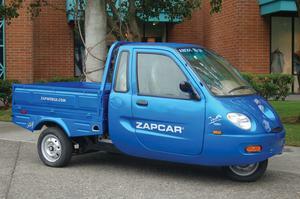 ZAP believes this is the production<br>vehicle designed for the US market by a China auto<br>manufacturer, and it is 100 percent electric.